(3) to devise schemes of recreation for Irish people. Nally was the first to organise a national athletics sports meeting, on his father’s farm in Balla, Co. Mayo. At the time of the GAA’s founding, Ireland’s morale was at a low ebb. The GAA became one of the great cultural revivalist organisations founded in that era. The Irish people began to recognise, and take pride in, Irish culture. ‘Celtic Dawn’ was an accurate description of the changes at many levels of Irish society. As injustices were rectified and educational and economic opportunities created, some of the growth and cultural expansion that had been halted by the Act of Union re-emerged. This cultural renaissance, advanced by many members of the GAA, led to an increasing desire for Home Rule. 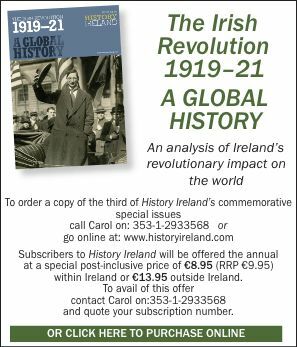 Irish separatists at this time still primarily promoted a ‘constitutional’ solution to their aspirations, rather than the ‘physical force’ solution fostered by the Irish Republican Brotherhood (IRB). The IRB, however, utilised meetings of the GAA as prime opportunities for recruitment—not the last time that the Brotherhood would exploit other organisations to further its separatist aims. Joseph E.A. Connell is the author of Where’s where in Dublin: a directory of historic locations, 1913–1923 (Dublin City Council, 2006). M. De Burca, The G.A.A. : a history of the Gaelic Athletic Association (Dublin, 1980). S. MacNamara, The man from Carron (Dublin, 2006).